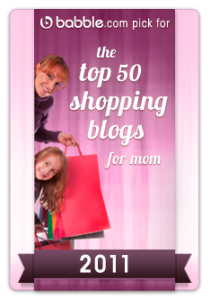 I’m thrilled to announce that Mommies with Style has be selected by Babble as one of their Top 50 Shopping Sites for Moms for 2011. And they even broke it down a bit more and named us #3 for “Best for Bargains,” woohoo! I love Babble and this is a huge honor. Why we love it: This one offers a little bit of everything. 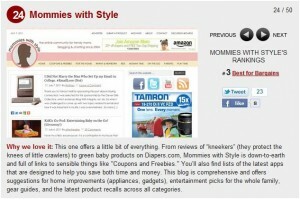 From reviews of “kneekers” (they protect the knees of little crawlers) to green baby products on Diapers.com, Mommies with Style is down-to-earth and full of links to sensible things like “Coupons and Freebies.” You’ll also find lists of the latest apps that are designed to help you save both time and money. This blog is comprehensive and offers suggestions for home improvements (appliances, gadgets), entertainment picks for the whole family, gear guides, and the latest product recalls across all categories. That’s HUGE!!!! Congratulations Whitney!!!! Well-deserved!!!!! I am NOT surprised in the least. Mommies IS indeed the best, always has been, always will be – is there any question? i think not. . Kudos galore to Mommies. . . . Thanks all – I’m thrilled about it!